Venue entrance is in Kerkhofstraat, so not the school's main entrance in Turnhoutsebaan. The entry fees for competitors are €8 for both days and €5 for one day. This must be paid through online payment. See registration tab for more details. There is a competitor limit of 105 competitors. If you registered but are unable to attend, please cancel your registration so someone else gets a chance to compete. If you are on the waiting list, we will contact the first person on the waiting list once someone else cancels their registration. If you registered but are unable to attend for some reason, you can cancel your registration by sending an email to the organizers. If you do this before the 11th of February (the Sunday before the competition), we will refund your entry fee minus €0.50 (bank transfer fees). The schedule might still be changed slightly. 1. * You can arrive at any time of the day. Just make sure you are well in time for the first event you are competing in. 2. ** 3x3 blindfolded: 20 minutes is a cumulative limit for all solves you want to attempt, which includes your times in case of a DNF. You can take the train to Antwerp Central Station first, which has plenty of direct connections. From here on, the venue is easily accessible by either bus or tram. At Antwerp Central Station Perron 1 (the stop at the little square in front of the Central Station), you can either take busses 410, 411, 412, 413 or 414 to bus stop Wijnegem Dorp. 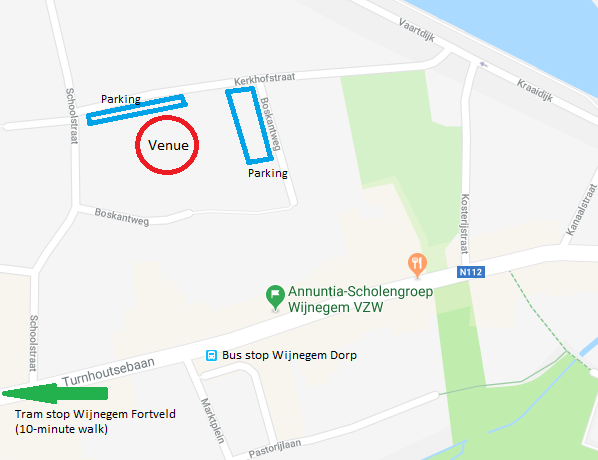 The entrance of the venue is in the Kerkhofstraat. You can also take trams 5 or 10 (direction Wijnegem) in the underground stations at Antwerp Central Station. Here you get off at Wijnegem Fortveld (the final destination), from there on it’s a 10-minute walk in the same direction. These rides are all about 25-30 minutes. Wijnegem is located near the E313 highway, 15-20 minutes from Antwerp. Parking: There are some parking spots around the school, these are indicated on the map. Otherwise you can simply park your car on other parking spots along the streets.